Is living by a code of ethics something you want to do or something you feel you should do? Whatever your reasoning, it’s a good idea. It’s my personal opinion that you live by a code of ethics because it’s something that keeps you in touch with your beliefs and helps you avoid regrets. When you conduct business using a code of ethics, it should make you feel good. It should be something you want to do. Living by your ethics should be a priority and it makes life easier, especially when you make a decision; any decision will be a firm decision. Once you make a decision based on your code of ethics, there is no looking back and saying maybe you should or shouldn’t have. I have a strict code of ethics that I go by and one rule is to be honest when I’m making money. If I feel I’m cheating I won’t do it. I was introduced to a business opportunity which involved affiliate marketing. Even though my main business is A Touch of Busness.com I have always had a passion for affiliate marketing. So I was presented with an opportunity to easily make a few hundred dollars a day with affiliate marketing. I went through the training for a couple weeks doing a bit each day. As I was ready to launch my campaign, I found out that the tool I would be using is a spy tool. It looks at others’ campaigns, takes the same product and keywords that someone else is successfully using, then clones their advertisements. So all you have to do to make money is, basically, clone others’ campaigns and run them as your own. Even though I knew I would be able to make money from this system, I knew in the end, when I was sitting on an extra load of cash, I wasn’t going to feel good about it. I wouldn’t feel successful; I would feel like a thief. So I immediately canceled my account and quit my training. I decided it wasn’t worth it; that’s not how I want to increase my success. So you see I live by my code of ethics, what I feel is right, and you should do the same. Because it’s you that has to live with yourself, whether what you’re doing is right or wrong. 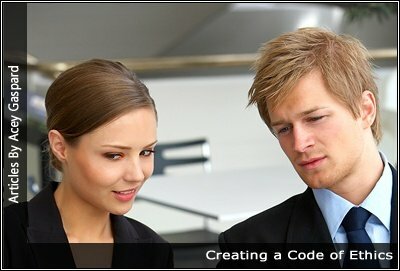 The following may help you come up with some of your own code of ethics. Keep in mind that your code should be yours and should be what you are comfortable with. There is nothing more rewarding than succeeding honestly. Whatever you do, do your best and try to add value to the products and services that you are providing to your customers. Life is about people, not money; respect people more than money and you’ll feel good. Money is important and a blessing but it’s not more important than other people. You’ve heard the saying, “It’s nothing personal; it’s just business.” If I have a say in the matter, this phrase doesn’t fly with me. Even though I’m in a business, I like to keep in mind that it’s a person I’m dealing with and I am affecting a person’s life. If I’m going to put someone on the street to make a profit, I can’t do it. There has to be a better way. That doesn’t mean I don’t take care of my interests, but when I can do something that benefits both parties that’s the route I’ll take. I always prefer win-win over win-lose. Whenever I’m trying to make a decision that’s not clear, I’ll put myself in the other person’s shoes, and that usually makes things clear for me. I could go on with my code of ethics, but you don’t need to listen to mine anymore; you need to create your own. Also, you have to keep in mind that this is my code of ethics. You may agree and you may not – that’s okay; do what makes you feel right. I do have one final thought to run by you: Remember, this world is about people, not possessions. You can affect people in a positive way or a negative way. One other point I’d like to make is: living by a code of ethics is not always the easiest thing to do. Especially if they slip your mind. And my code of ethics may have me looking like an angel. But that’s not the point; the point is to create a code of ethics you can live by. In my opinion, it’s better to have a strict code of ethics because it keeps you in check. Next article4 Minutes to Feeling Better About Your Life!